Los Angeles, CA--Visitors to the Dinosaur Hall in the Natural History Museum of Los Angeles County can now experience the wonder of the prehistoric creatures in a totally new way with exhibits featuring audio-visual systems provided by Electrosonic. Twice the size of the old galleries, the recently-opened 14,000 square-foot Dinosaur Hall displays specimens – including the world’s only T. rex growth series of baby, juvenile and adult skeletons – mounted on unique platforms and preserved and articulated using modern methods. The skylit L-shaped Hall is flooded with natural light; a glass-sided mezzanine runs along the short side of the L where additional wall-mounted exhibits reveal more about the creatures and show what it’s like to find fossils in the field and study them in the lab. Electrosonic was responsible for the design, engineering, fabrication, installation and programming of the Hall’s audio, video and interactive displays. Electrosonic’s Design Consulting team was approached by museum project manager Jennifer Morgan and asked to develop an AV system design that would subtly support the new interpretive material. “The AV interactives for the dinosaur specimens are integrated into the bases that support them,” said Steve Coe. Electrosonic was charged with mounting rugged ELO touchscreens into the bases’ access panels so visitors can review graphic panels and interactive videos created by Unified Field to learn more about the bones. Electrosonic was also challenged to build the interactive computers into the bases, which minimized the use of extenders that would have been required if they were located in the third-floor equipment room. “It was more efficient and reliable to hide the content players in the exhibit than position them in a remote location,” Coe said. When visitors walk past the Triceratops and the 68-foot Mamenchisaurus in the new Hall, they encounter a 15-foot wide front projection screen suspended about nine feet above the floor. Its looped “Investigating Dinosaurs” video describes the hunt for the prehistoric creatures. Electrosonic chose a Christie HD10K-M series projector for the display with Medialon playback and fiber optic connections from the players to the projector. A pair of Renkus-Heinz speakers is located behind the screen. Below the projection is a 43-foot Fossil Wall showcasing 100 diverse dinosaur specimens. Two ELO touchscreen kiosks from Electrosonic were positioned in front of the wall to allow visitors to explore each bone and zoom in and rotate some of them 360 degrees on the screen. A five-screen ribbon of 40-inch Samsung LCD monitors on another wall is hung at head height. Five Medialon MIP HD players in the equipment room are synced together to display edge-blended content across the screens or five discrete images. A multi-touch screen, which can handle 32 simultaneous touches, is positioned alongside an exhibit of excavation tools. Its table-style configuration, made by CyberTouch with PQ Labs’ infrared touch technology, allows groups of kids to assemble and play a game that simulates a dinosaur excavation. Several wall-mounted 46-inch Samsung LCDs with ceiling speakers display content supporting nearby exhibits. Electrosonic supplied Dell computers for the interactives and implemented BSS London BLU audio signal processing; Medialon Showmaster show control connects to all AV points. The exhibit design was by Evidence Design. Fabrication of the entire exhibit was awarded to Lexington Design & Fabrication, whom Electrosonic was contracted with and has worked with on many projects over the years. The project manager for Lexington was Howard Smith. All interactive media programs were created by Unified Field, another firm whom Electrosonic has a strong working relationship with. 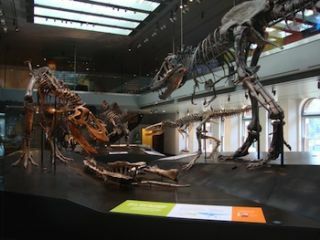 Although Electrosonic Design Consulting became involved in Dinosaur Hall in August 2010, fabrication and equipment orders didn’t begin until April 2011 for the Hall’s July opening. “The big challenge was working with other vendors on the sequence of events so we knew what equipment to bring on site,” said Calver. “So much of what we did integrated to what was designed and fabricated in place. We needed to be able to evolve with the exhibits as they were built.” In the end, a successful integration was realized due to thorough design documentation and an experienced working relationship among Electrosonic, Lexington and Unified Field. Electrosonic’s Peter Alexander served as project engineer for the Dinosaur Hall ensuring that everything was well coordinated on site; he also handled Medialon programming and calibrated the touch panels.